^ a b c d e f g Azzi, Stephen. 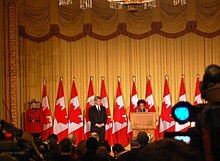 "The Canadian Encyclopedia". In Marsh, James Harley (ed.). 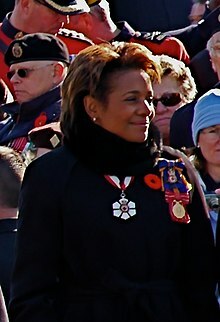 Biography > Governors General of Canada > Jean, Michaëlle. Toronto: Historica Foundation of Canada. Archived from the original on October 7, 2014. Retrieved October 21, 2010. ^ Jean, Michaëlle (January 27, 2010). "Launch of the Michaëlle Jean and Jean-Daniel Lafond Endowment Fund". In Office of the Governor General of Canada (ed.). Media > Documents > News Releases. Ottawa: Queen's Printer for Canada. Retrieved February 1, 2010.